Welcome to APUSH Period 1 review! For those of you who are joining for the first time, hope you enjoy your stay and come back for the other periods. If you've been here before, welcome back! In this review we explore themes in precolonial America through practice questions. Included with each question is the answer and an explanation about why it is the correct response. While we can categorize this period as the time where the Old World made contact with the New World, there is much more to that. Period 1 discusses Native American migration and dispersion throughout the Americas. It goes over their unique traditions, complex society and distinct culture that was built as the Native Americans settled in the Americas. Furthermore, given North and South America's very diverse environment, Native Americans demonstrated a remarkable ability to adapt to their surrounding environment. Of course, one of the defining hallmarks of period 1 was the arrival of European settlers to the Americas. While it was certainly not the first time Europeans made contact with the Americas (think Vikings), we do know that this time, the settlement is on a much larger scale. It started with the Europeans and Native Americans being introduced to new foods and goods from each other. However, Europeans also brought measles and smallpox with them, which ultimately decimated giant Native American empires such as the Incas and Aztecs and wiped out millions of Native Americans. The Europeans took advantage of this opportunity and quickly dispatched ships to the Americas to claim territory. With newfound land, Europeans gained vast reserves of resources and amassed great wealth, a factor that began the slow transition from Feudalism to Capitalism. The Europeans also brought Christianity with them and quickly set out to convert the Natives to Christians. We even see Africans play a role in these interactions, as Europeans shipped African slaves to the nascent colonies in the Americas. Such interactions could be witnessed though the Trans-Atlantic trade route, where we see an exchange of social, economic and cultural exchange between Africans, Europeans and Native Americans. Get the eBook from Amazon by clicking on the book cover above to view more stimulus-based multiple choice questions like the ones covered below. “...The Brafferton Indian School in at the College of William and Mary in Williamsburg, Virginia... was established so ‘that the Christian faith may be propagated amongst the western Indians, to the glory of almighty God...’ The hope on the part of the founders was that the students would return to their nations and act as agents of ‘civilization’ and Christianization amongst their people. A. European settlers in the colonies believed in the superiority of their own culture and attempted to propagate it. B. European attempts to change American Indian beliefs and worldviews were met with little resistance. C. Africans’ cultural and linguistic adaptations to the Western Hemisphere resulted in varying degrees of cultural preservation. D. indentured servants of European descent were the main source of coerced labor in the colonies in the 17th century. Explanation: The passage suggests that European settlers in the colonies believed in the superiority of their own culture and attempted to propagate it. This is reaffirmed by how the author discusses how American Indian children would return as "civilized" members of society. The correct answer is A. When we look at the passage, we can see that William White from Colonial Virginia looks down upon Native American culture, as he believes that European education and Christianity could "civilize" the Native Americans. This ethnocentric attitude was one of the countless attitudes Europeans not only held towards Native Americans, but towards Africans as well. The issue with B is American Indians did not meet European culture with open arms. In fact, American Indians put up fierce resistance against Europeans, as Europeans attempted to reshape and alter culture that Native Indians deeply cherished. Looking back to the passage, we can see an Iroquois chief insisting to European settlers that they (Iroquois) will stick to their traditions. Moreover, the passage even says that the English settlers had a difficult time filling seats at schools specifically designed to indoctrinate Native Americans. Choice C talks about Africans' impressive ability to adapt their culture and language to European standards. For instance, we could see this with the Creole language and Santeria, a religion that fused Roman Catholicism, Yoruba mythology (West African religion) and indigenous cultures found in the Americas. However, this topic isn't even discussed or implied at all in this passage. Remember to use relevant information and context clues a passage gives you when answering questions. As for answer D, while indentured servitude was more prevalent than slavery (in North America at least) in the 17th century, this text makes no reference to it at all either. 2. The excerpt demonstrates which of the following continuities in American History between the 15th and early 20th centuries? Explanation: The passage is about efforts to assimilate minority groups, specifically in context of the passage the American Indians. D is the correct answer because Europeans did actively attempt to assimilate the Native Americans. In this case, William White from the text states that he seeks to proselytize the Native Americans into Christianity in order to for them to assimilate into "civilized' colonies. Choice A talks about territorial displacement of Native Americans, which is historically true. In fact, we see this on a much larger scale once the colonies become the United States of America. In spite of this, this passage specifically talks about converting Native Americans into Christians and slowly integrate them into colonies (at the expense of their culture). Remember that context is key to succeeding in the exam. This passage specifically refers to a time where English settlers attempted to fully integrate Native culture into theirs. This is not necessarily the same as territorial displacement. Remember, Native American displacement becomes a much prominent theme later in American history. Answer B talks about treaty violation(s). This passage makes zero references to treaties and in fact implies that English settlers engaged in dialogue with the natives in order to convince them join their schools. Furthermore, natives such as the Iroquois chief politely declined their "invitation". That does not sound like a treaty violation. And finally, C frames settlers as people respecting the minorities' autonomy, which is clearly not the case as settlers are frequently labeling them as "savages" and believe that their culture is superior to that of the Natives. A. the introduction of new crops and livestock by the Spanish had far-reaching effects on economic, social, and political development in the Western Hemisphere. B. European exploration and conquest were fueled by a desire for new sources of wealth, increased power and status, and converts to Christianity. C. new sources of mineral wealth from the Americas facilitated the European shift from feudalism to capitalism. 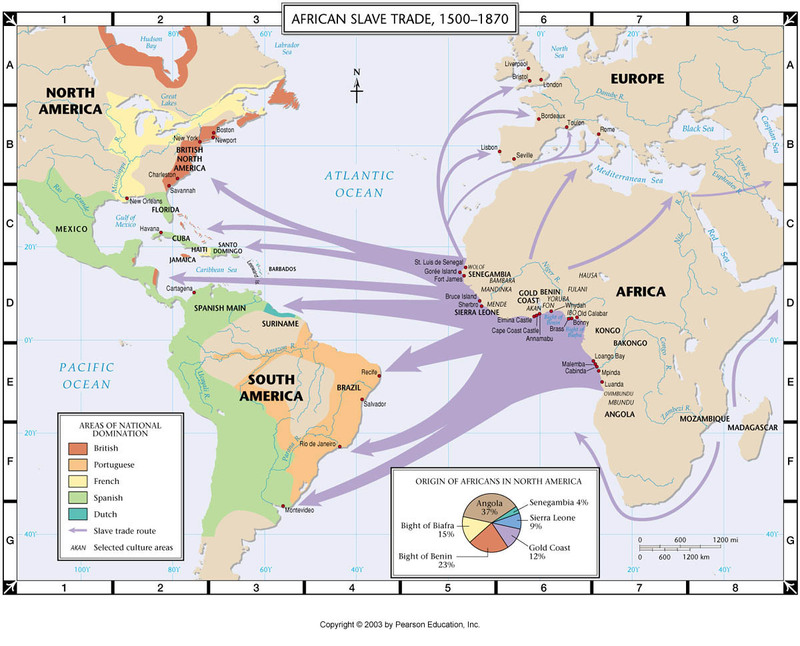 D. in spite of slavery, Africans’ cultural adaptations to the Western Hemisphere resulted in varying degrees of cultural preservation and autonomy. Explanation: European exploration and conquest were fueled by a desire for new sources of wealth, increased power and status, and converts to Christianity. This can best be seen by how the passage alludes to the Western discovery being a great way to spread the gospel of Christianity. In addition, the author conveys the idea of new sources of wealth and increased power by colonizing the Western World. When examining the given passage, it talks about how the settler wishes to convert the Natives into Christians and rid them of their culture by slowly integrating the Natives into their colonies. However, the settler also hints at violent means of control should the Natives refuse to cooperate. The new lands in the Americas provided the Europeans vast reserves of resources and opportunity. They intended to use both to become wealthy. Along the way, they would spread their influence through religious conversions. Answer B essentially summarize what European settlers set out to do. Discourse of Western Planting is a document (written by Richard Hakluyt) that basically urges English Crown to invest more in the new colonies as the Spaniards were making great profit from their own colonies. Spain and England were indeed rivals, especially when it came to establishing territory in the New World. Nonetheless, this excerpt talks about general European attitudes and goals towards the Natives and the Americas, not competiton between European nations. As a result, you can safely scratch off this answer. As previously mentioned, thanks to the Americas diverse terrain, it was filled with all kind of valuable resources, which would play a factor in changing economic systems in the Western Hemisphere. However, this excerpt does not concern itself with feudalism and capitalism. It solely talks about extracting resources and converting the Natives. Africans do not make an appearance at all in this excerpt, so cross this answer D off immediately. 4. Which of the following effects of European colonization was foreshadowed by the excerpt? Explanation: The decimation of Native American populations by smallpox was foreshadowed by the excerpt because of the line: "Otherwise for preachers to run unto them rashly without some such preparation for their safety, it [might lead to] their apparent and certain destruction". The referenced destruction in the passage is alluding to the spread of disease. If threatening the Natives' safety did not ring a bell, then "certain destruction" should have. The ultimate downfall of the Natives was due to their exposures of unencountered diseases, namely smallpox and measles. Now, answer C talks about Native retaliation against the Spaniards- a result of the inhumane treatment the Pueblo Indians faced from them (Spaniards). To be fair, this rebellion is a direct result of European colonization. With that being said, this question is asking in more broad terms, hence making answer B a much more suitable answer than C.
While Maryland's 1649 Act granted full religious tolerance for all Christians, this question specifically refers to the relationship between the European settlers and Natives. Given that this act has little to do with Native Americans, you can ignore A and move on. As for answer D, the rapid influx of silver in European economies mainly concerns itself with Spain. Whenever you hear silver influx, just think Spain. After all, they controlled silver mines in the Andes mountains. Similar to answer A, this passage does not relate to inflation or European economies. Eliminate answer D and continue to the next question. D. French and Indian War. Explanation: The Protestant Reformation was a major 16th century European movement aimed initially at reforming the beliefs and practices of the Roman Catholic Church. Its religious aspects were supplemented by ambitious political rulers who wanted to extend their power and control at the expense of the Church. The key to successfully answering this question is knowing how to assess historical time periods. This excerpt was written in the late 16th century. With this in mind, let's look at our options. Answer A proposes the Progressive Era. The Progressive Era does take place in the United States and we will cover it, but much down the line as it occurs in the early 20th century. Since that is off by more than 3 centuries, we can be very certain this passage does not allude the Progressive Era. Answer B says it is the Protestant Reformation. This is very possible, as it was a major movement that occurred not too long ago from the time this passage was published. Keep B as a possible answer. Answer C concerns itself with the Great Awakening, a religious reawakening that swept all over Europe and the American colonies in particular. While it is relatively close to the moment of this passage, this has primarily to do with evangelical revitalization of the colonies themselves, not the natives, so C cannot be the answer. And finally we are left with B, the French and Indian War. This conflict, although involving Native Americans, is mainly about territorial conflict between the English and French. As a result, the best answer to this question is B. 6. Which of the following continuities present throughout the 15th-early 20th centuries of US History is directly reflected in the excerpt? Explanation: The prevalence of the belief in the superiority of white culture was present throughout the 15th-early 20th centuries of US History. The author reflects on how he believes the Christian European man is above all. We will start with the answers that are completely incorrect. Answer A deals with topics that can't possibly be reflected in the passage since a)there was not an American government and b) there was little party disagreement when it came to Native American displacement. Answer D talks about separation of church and state. 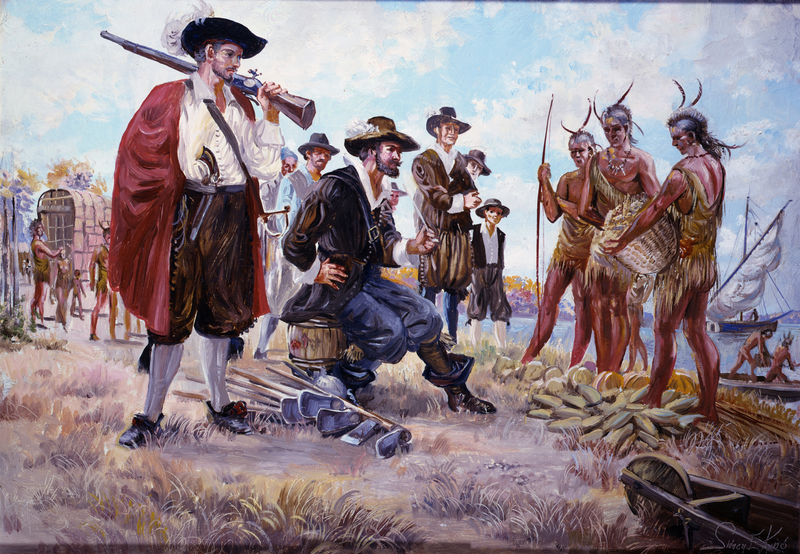 Although this idea would incorporated into the underlying structure of the United States, settlers are attempting to convert Natives into Christians. These actions could arguably be the opposite of what the separation of church and state advocated for. Basically, settlers believed that to successfully assimilate the Natives into their culture, they had to be Christian, implying that it was an essential feature into their society. We are left with Answer B and C. The passage talks about does indeed advocate for colonial expansion, similar to how Americans throughout the 19th century sought to expand westwards. Answer C provides evidence towards the ethnocentric attitude Europeans (and later, Americans) had against the Natives. Overall, what makes answer C a more suitable answer than answer B is that excerpt talks about expansion and Christian proselytization, not just territorial expansion as B says. In closing, Period One explores early relations between European settler and Native Americans. Overall, Europeans chose to assimilate Native Americans into their culture through violent means (slavery) and/or cultural religious indoctrination (like we saw with those schools in the first passage). In addition, early European interactions with the Natives would sow the seeds to how the eventual Americans would interact with them (territorial displacement through force). Aside from that, however, we briefly saw how religion played an important role in the early colonial days of America (we will review this in greater depth in the following review). 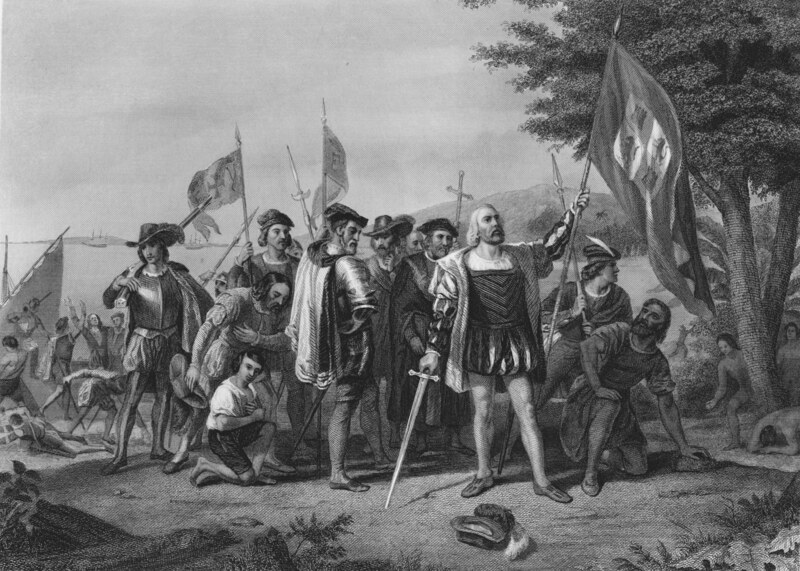 Furthermore, the Europeans race to establish colonies in the Americas would set the stage to eventual conflict, particularly among the English and French settlers. Although we did not see it in this review, the significance of the Trans-Atlantic trade cannot be ignored, as it formed an interaction between Africans, Native Americans and Europeans. Get 300+ APUSH exam questions. Use LAUNCHPROMO for 20% off until April 15.